Total 100 questions will be there from these 5 subjects, 20 from each of these. Total time provided to solve the paper is 2 hours. Full Books of Fsc are to be covered for Sciences (Bio, Chm, Phy). For English questions will be from synonyms, antonyms, grammar and comprehension. In this session we will provide chapter wise tests of Bio, Chm and Phy (all chapters). These will be online tests. When you will solve the test you will be shown the correct answers and the solutions of all the questions. 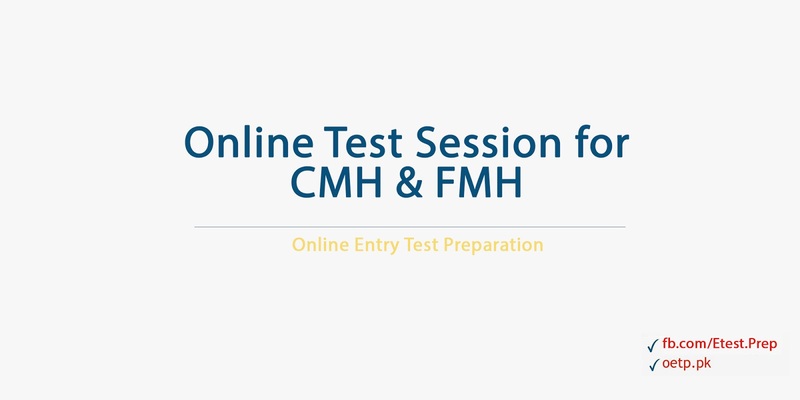 Moreover a guide on how to solve the intelligence questions (For CMH) along with practice questions will also be provided to the registered students. Notes about general knowledge (For FMH) will be provided. Questions from past papers, which we could, will be shared with the students. Open the course page ( link : http://oetp.pk/course/online-test-session-for-cmh-fmh/ ), click on Take This Course option, a form will appear, fill and click on Place The Order. Fee details will be shown to you, you will also receive a receipt via email to your email address. Submit the fee in HBL and send a picture of the paid deposit slip via email to us and your course will be approved. In case of any issue feel free to contact.